Mini Purse Single by Color Choice. 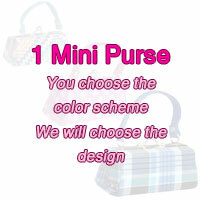 You choose a color scheme and we pick out a mini purse for you with that main color in the design/material. The designs will be random, depending on in-stock supply of your color choice at the time you order. Great for giveaways, package enhancements, gift with purchase, coin purses and just a very cute way to say Thank You!! Fill with small giveaway for a nice hostess gift or to play a booking game. Approx. 3.5" x 1.5" x 2". Purse handle is approx 3.5".